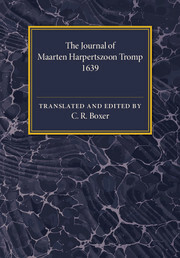 Originally published in 1930, this book presents an English translation of the 1639 journal of Dutch naval commander Maarten Harpertszoon Tromp (1598?1653), who led the Dutch fleet in a decisive victory over the Spanish at the Battle of the Downs during that year. Translation of the journal was carried out by Charles Ralph Boxer (1904?2000), a renowned specialist in Dutch and Portugese naval history and the early colonial expansion of European nations. Created in response to 'an increasing interest shown by English historians in naval matters', the text provides both an insight into Dutch naval strategy and a revealing portrait of Tromp's character. A highly detailed introduction, illustrative figures and a bibliography are included. This book will be of value to anyone with an interest in European and Maritime history. Preface; The sources for the study of the campaign of 1639; Introduction: 1. The preparation of the Armada; 2. Tromp's cruise in the narrow seas; 3. The fights in the channel; 4. The Downs; Prefatory note to the Journal; Journal of M. H. Tromp, April–October 1639; Appendix 1. Dom Francisco Manuel's account of the fights in the channel; Appendix 2. Letter of Tromp to the States-General, August 9th, 1639; Appendix 3. Tromp's secret orders; Appendix 4. List of the Spanish Armada; Appendix 5. A note on the Amelia; Bibliography; Index.